My Mac Book Pro is a quad core i7 with 16GB of RAM. It is a beast that can crunch GigaPan files stitched from over 300 single images ... but completely unnecessary on most other jobs. I could get away with a machine that is half as powerful on most days. *Finalize selects with a "red" tag in Photo Mechanic, and finalize complete caption information. *Open the final selected images in Photoshop. *Crop, tone and sharpen images. *Save then to a folder on the desktop, and FTP the images to the client. Often, I need to do this as quickly as possible. Deadlines are always set and you are always running up against them. Although a laptop is fairly small, the MBPro is 5.5 pounds, you have to add the power brick, the card readers, the extra cables, extra HD and restore DVDs. The backpack has become pretty hefty. Preston Mack has adapted the iPad as part of his photo workflow. Why do I need to carry all that stuff? The quick answer is that I don't. It’s time for a change. The review I am doing is based on the BETA version of Picture Pro V2.0 running on an iPad 4 (64 GB) but V2.4 is now available for purchase for $49.99. When you ingest a card of images, it is organized as a new "event" in your iPad's Photo library. This is what you select when you are in the Picture Pro import menu. Once it is loaded, you can look at the take in either grid view, or single view. (A quirky thing about the iPad is that it does not recognize "tagged" images from the DSLR. You will need to audio tag your images on your DSLR in order to have a way to sort your selects from your camera). This is reminiscent of how you edit in Photo Mechanic. You can apply a batch caption to all images here. When you find the image you want, you select the "loupe" view and it enlarges the image. Of course, you can pinch and pull to zoom and scroll within the image. Now you can apply all the toning, sharpening, etc. to the image. The full suite of brightness, levels, contrast, etc. are offered. These "filters" appear pretty basic, but they seem to do a good job. A great aspect of this app is that if you import the RAW file only, the RAW file is adjusted. You can make some powerful color and exposure changes here. If you import both the RAW+JPG, the app will adjust the JPG only. After you are finished toning, you hit the export button and you can either email or FTP the image (Facebook and Twitter buttons are one touch to send). The best thing about this program is that you can do everything you need out of this app. Edit, caption, tone and transmit from one place. I am confident that I can shoot a deadline job with only this app. *Full screen! I'd like to be able to see the "loupe" view (single selected image) full screen so I can really inspect the image. *There needs to be a horizontal view in addition the standard vertical view. I like to work on a horizontal screen, especially if the image I am working on is horizontal. *Some buttons need to be bigger. The buttons on the IPTC menu are too small. *There is a quirky way that the email profile is set. You shouldn't have to set an email and an SMTP server for every address you want to email to. That should be set once in settings, them you should be able to email and send images to whomever you want quickly. *I would like an "image size" button. A way to see the pixel dimensions and resolution. You need to be able to resize easily. There is also a unique feature with this app. Every time you transmit a photo, it saves the photo in a folder you designate. It is a hidden folder that you can access only via FTP from another computer on the same Wi-Fi network. You FTP into your iPad, and pull the entire transmit folder to archive or to just have as a backup. Of course, you will need to keep an eye on these hidden files, as the photos will eat away at your iPad storage. I wish there was a way to delete these files without having to FTP in from your laptop. I like that the developer of Picture Pro, Dave Shields, is a working photographer. He designed this app for working photojournalists, not for the Instagram crowd. And better yet, he is very easy to contact. For a comparison, I have used other iPad photo apps like Snapseed (free) and Filterstorm 4 ($3.99). Snapseed (Google) is a great photo app. Very simple to apply the filters (swipe up to pick a filter, left or right to strengthen or weaken the effect). It is a very polished app. Very slick. I enjoy adjusting the images in this app, but you cannot FTP or apply IPTC data to images. This app definitely is more of an Instagram filter app, not a working photographers program. Filterstorm 4 was my default choice for a photo-editing app till Picture Pro arrived. It supports both horizontal and vertical view (Picture Pro only works vertical); you can tone, crop and adjust images. You can apply IPTC data to the image, but no code replacement. (The Filterstorm app has a pretty serious IPTC bug right now. You cannot save and apply IPTC files to your photos. I messaged the developer and he said a fix is in the next update). It has a very easy export menu, complete with FTP, SFTP, email, Facebook, Twitter, Dropbox and Flickr. I like the app, but I feel that the menus and the interaction with them are a little awkward. 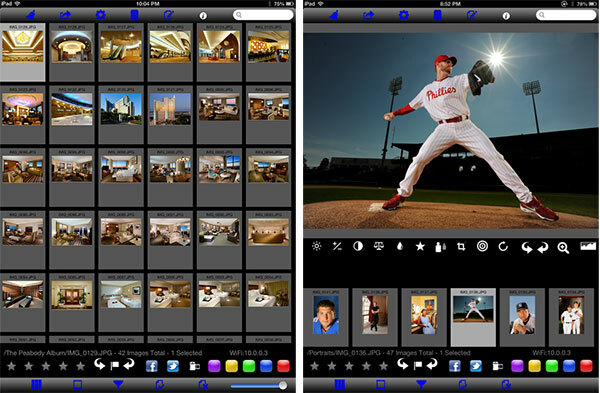 The Filterstorm Pro ($14.99) app is the same, but it adds the ability to import an entire folder from your iPad photo library and apply a batch caption to it. But again, no code replacement. I feel that Picture Pro is a very good app. A working photographer can immediately use this to file images on deadline. It has only a slight learning curve. Picture Pro does it's best to mimic Photo Mechanic and allows you to maintain a professional workflow. The captioning aspect of the app is second to none on a tablet. Is it worth $50 when you could buy Filterstorm Pro for $15? Tough call ... I don't know. I am serious about using the iPad as a deadline device, so I am willing to gamble since I want the best app I can get. And in my opinion, this is the best app for photojournalists right now.